Travel to a far-flung tropical island with a great value Indian Ocean holiday. Browse our range of luxury getaways to Indian Ocean destinations like the Maldives, Mauritius and the Seychelles and escape to the palm fringed white beaches of paradise. Those looking for scenery and adventure, can experience the best of both worlds with another Indian Ocean gem…Sri Lanka. The islands in the Indian Ocean are among some of the remotest places in the world, but the local hospitality will make you feel most welcome. How far away is the Indian Ocean? You’ll be pleased to know the idyllic holiday islands of the Indian Ocean are closer than many people think. In fact, the main destinations can all be reached in around 12 hours or less, many with flights direct from various UK airports. Once you arrive into the Maldives and the Seychelles, many guests will also get to experience the delights of a sea plane, direct to the island you are staying on via a short flight. So, if you’re looking at ocean holidays for your next trip away... why not make yours the Indian Ocean? If it’s a luxury all-inclusive getaway you’re after, then the Indian Ocean offers plenty of superb options. Indian Ocean holidays are also one of the most popular choices for honeymoons, with loved-up couples jetting to the romantic islands to enjoy the stunning beaches and pristine waters. Whether you’re staying in a beach villa, overwater bungalow or a private island resort, the Indian Ocean will serve up some of the very best in authentic cuisine and premium drinks, without you having to lift a finger. The resort offerings in the Indian Ocean are also some of the most generous worldwide, with plenty of all-inclusive perks from complimentary spa treatments, fully stocked mini-bars, boat trips and water sports with equipment hire. How much are holidays to Indian Ocean destinations? 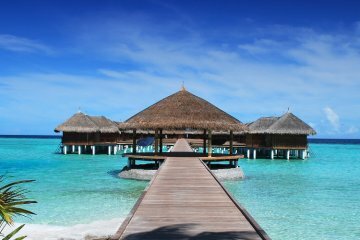 Don’t be put off by some of the eye-watering prices you can sometimes see for trips to the Maldives and the Seychelles for example. These islands still cater for all guests and there’s a huge range of hotels and resorts, ranging from 3 stars to 5 stars, across all of our Indian Ocean destinations. All inclusive is also optional in places, with bed and breakfast, half board and full board also available. If you’re looking to splash out though, be it for a special occasion like a honeymoon, a big birthday or simply just a holiday of a lifetime… you can’t go wrong with the Indian Ocean. You’ll find glitz and glamour in ultimate luxury, usually in the most private of retreats – you could say our Indian Ocean hotels and resorts offer heaven on earth. Pure white sands, glistening turquoise seas and laid-back, sun-drenched hours make the Maldives a dream destination for a luxury holiday. Every resort in the Maldives sits on its own private island surrounded by palm trees and picture-perfect beaches. If it is relaxation and indulgence you’re seeking, you’ll find both in abundance in the Maldives. As well as being the ideal destination for romance, some resorts also cater for families, while any scuba diving enthusiast will delight in the array of wildlife living beneath the waves. With beauty all around and a variety of lavish resorts to choose from, a paradise holiday in the Maldives will be remembered forever. The weather in the Maldives remains warm 365 days a year, with lows of around 24°C in November and highs of 31°C in April. However, like most Indian Ocean locations, it is prone to a monsoon season which usually runs from May to November. So, if you’re looking to stay dry (most of the time), whilst also enjoying the stunning weather in the archipelago, then you’ll be best visiting in the dry season from December to April. 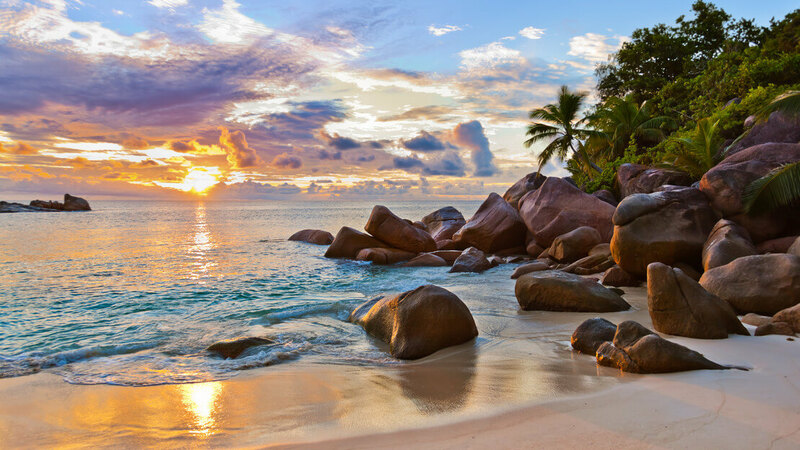 Holidays to the Seychelles are famed for ultimate relaxation on paradise beaches and luxurious resorts surrounded by captivating tropical scenery. However, this magnificent island nation offers much more, with heritage and history aplenty, breath-taking sights both on land and at sea, and a whole host of thrilling activities and water sports. As well as being the perfect destination for romance, the Seychelles also have plenty to appeal to families, with new adventures to be shared and magical memories waiting to be made during the holiday of your dreams. The Seychelles continue to top lists of the best Indian Ocean holidays due to the stunning weather it has all year around. The average temperature of 27°C makes it a perfect beach destination, and the scenery? Well that speaks for itself. The Seychelles do experience rainy spells from November to January, but these usually clear quickly for the sun to come out again. However, with May to September being the dry season, this sensational destination makes the perfect spot for a summer holiday. 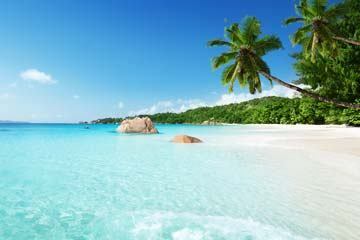 This being said, there isn’t a bad time to discover the Seychelles. Magnificent beaches, fascinating ruins, stunning wildlife and tantalising cuisine; Sri Lanka has it all and much more. Whether you crave sun-soaked days on glorious golden beaches, or seek to quench your thirst for adventure, you can do both during a holiday to this phenomenal destination. 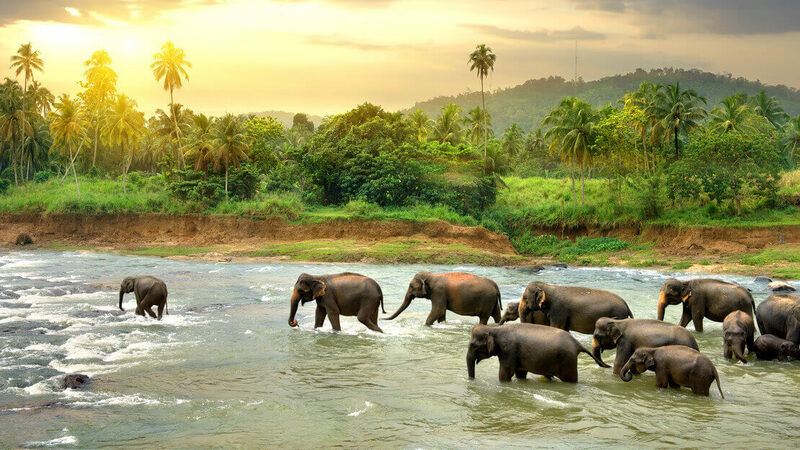 Spend your days exploring Sri Lanka’s spectacular national parks, home to wildlife including elephants, buffalo, crocodiles and deer, or simply make yourself at home in one of the many luxury hotels or resorts, taking advantage of the splendid facilities on offer. However you choose to spend your time in Sri Lanka and whoever you share it with – family, friends or a loved one - you’re sure to enjoy a phenomenal holiday experience that will live long in the memory. 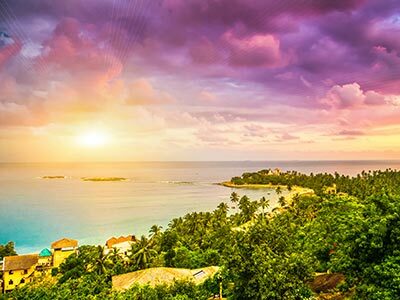 Unlike most of the popular spots in the Indian Ocean which have the same climate throughout, Sri Lanka has all round beautiful weather... depending on what part of the country you visit. There’re two monsoon seasons, one in the north and east, and another in the south and west, both at different times of the year. In the south western part of the country, you’ll be looking at a dry season between December and March, with heavy rain between May and September. Meanwhile, to the north east, heavy monsoon weather usually falls between October and January, with brighter skies and generally dry weather between May and September. Apart from the two previously mentioned monsoon seasons, Sri Lanka generally enjoys a tropical climate 365 days a year, with set seasons. Considered the ultimate tropical paradise, Mauritius delivers the finest luxuries and style in a captivating exotic setting awash with vibrancy and colour. From cultural exploration to complete relaxation on pristine beaches, holidays to Mauritius take your breath away, offering enchanting vistas and blissful days of pure indulgence. 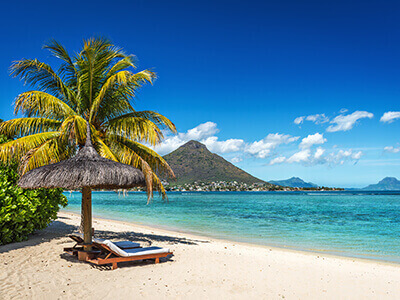 As well as being a much-loved location for dream weddings and a sensational honeymoon destination, Mauritius is also a fabulous choice for family holidays, with an array of fun outdoor adventures and activities to enjoy, as well as plenty of fresh local cuisine. 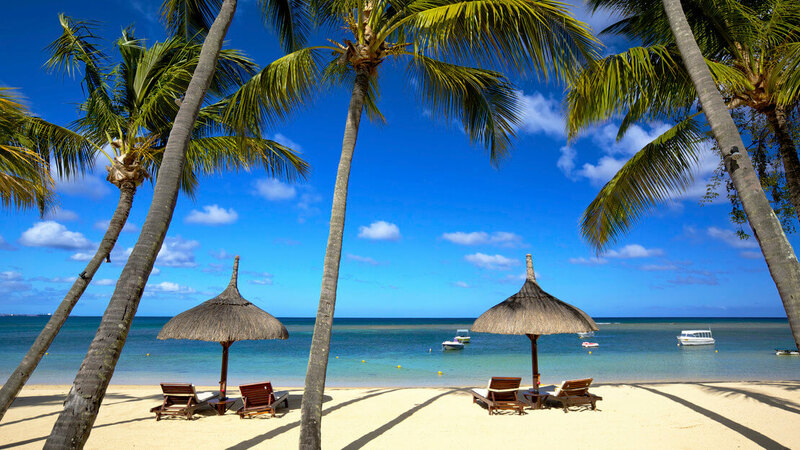 With partying, magnificent sunsets, a taste of history and crafts all on offer, Mauritius is the perfect choice for your next holiday. A big selling point to Mauritius is that it doesn’t tend to have a rainy season, allowing visitors to enjoy the glorious weather pretty much 24/7, 365 days a year. The certified dry season is May to November, but most months will see less than 5 rainy days. This makes the likelihood of your luxury holiday being a washout extremely unlikely, something you can’t say for certain about many other nearby locations. Why book an Indian Ocean holiday with Destination2? Destination2 offers a wide range of luxury hotels and resorts in destinations across the Indian Ocean. 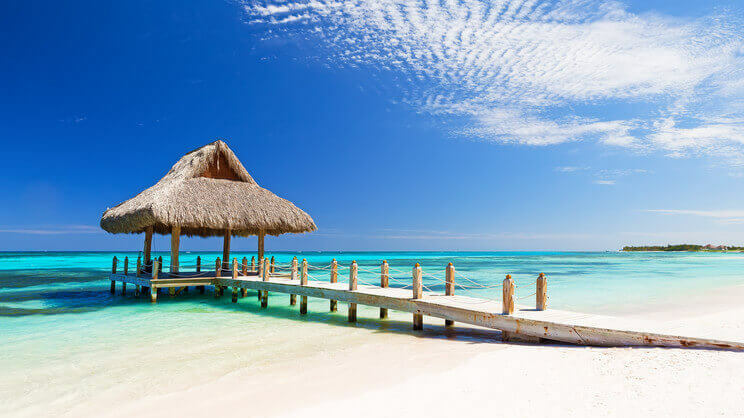 We are passionate about offering value for money and work hard to bring you the very best prices on holidays to the Maldives, Mauritius, the Seychelles and Sri Lanka. Our dedicated Indian Ocean specialists have a wealth of knowledge regarding travel to this sensational part of the world, and strive to uncover fabulous deals on sensational escapes. When booking with Destination2.co.uk, you also benefit from our Triple Financial Protection and the fact that our package holidays are fully ATOL bonded. Therefore, if you’ve find a package holiday price with one of our competitors (including Expedia, Destinology, FlightCentre, Trailfinders, BestAtTravel, Letsgo2, SouthallTravel, Away holidays and many more) which looks to be more competitive than your next Destination2.co.uk package price, just call us! *Conditions/restrictions may apply dependent on the type of holiday booked. Please call for details.